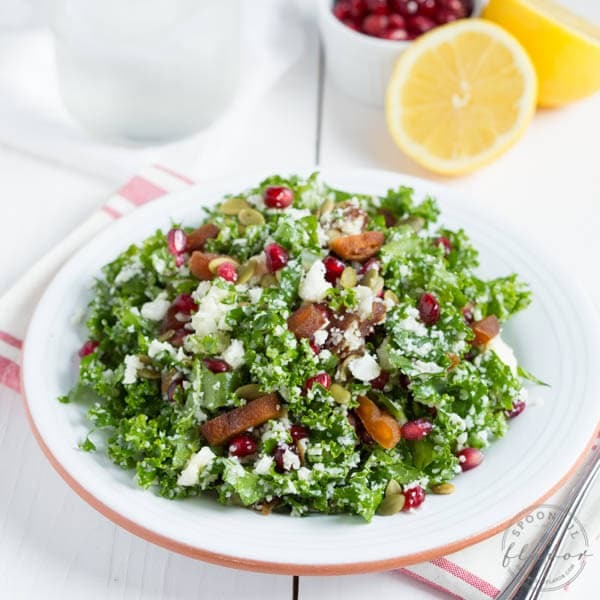 Cauliflower Kale Salad with Pomegranate, Dried Apricots and Pumpkin Seeds is healthy and delicious! 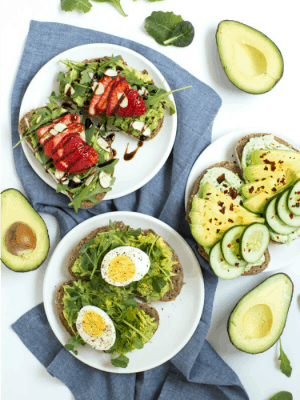 It is perfect for lunch and is a great way to detox. Winter vegetables are my favorite. Kale, cauliflower, beets and broccoli. I could eat them all every day and never get sick of them. With an abundance of fresh kale from my garden, I love enjoying it for breakfast, lunch and dinner. 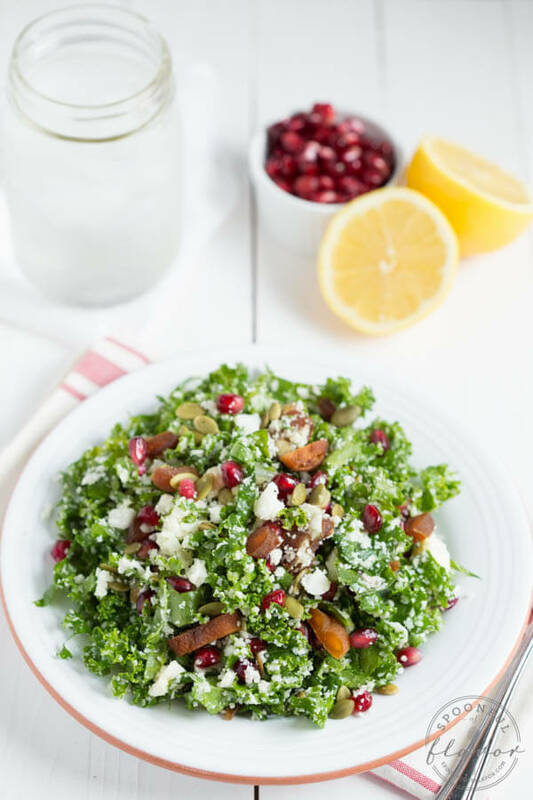 I love this salad because it combines sautéed cauliflower “rice” with kale, pomegranate, dried apricots, pumpkin seeds and a few simple seasonings. 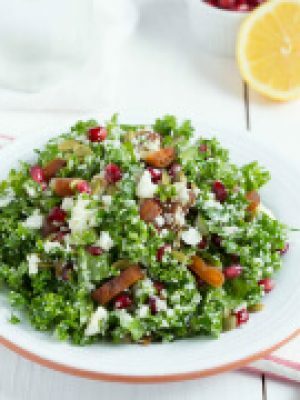 This salad is great to make ahead because it is still fresh and crunchy even after a few days. 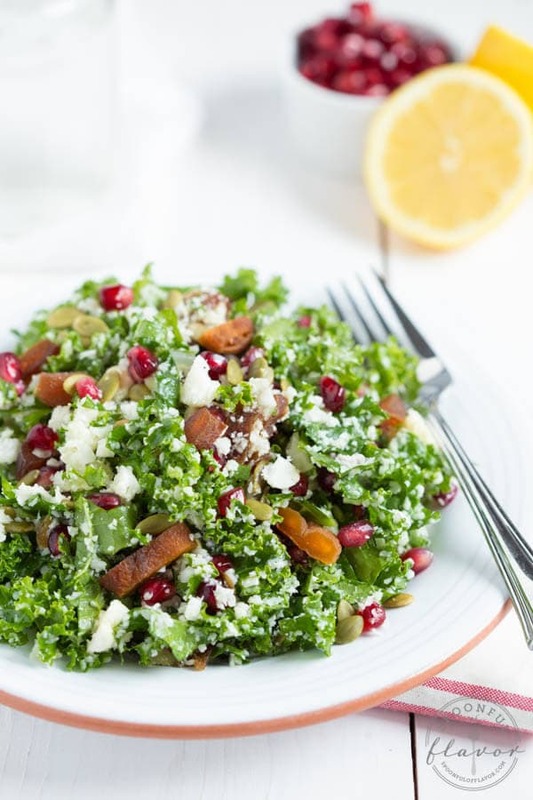 It is also a great detox salad and is the perfect salad for lunch during the week. One of my goals for 2015 is to prep meals ahead of time. So far, I’m really proud of myself. Each Sunday, I spend the afternoon prepping a few meals for the week. It makes life during the week so much easier. In fact, I am trying to get ahead with other things too. Whether it is meal prep, work or blogging related, I feel so much more relaxed when I get things done ahead of time. I’m one of those people who packs my calendar with more than I should do, and always gets everything done even if it means little time for sleep or relaxing. In addition to getting things done ahead of time, I’m really trying to clear my calendar for more down time. I not only feel like I am able to get more done, but I am able to relax a little too. It’s fabulous. 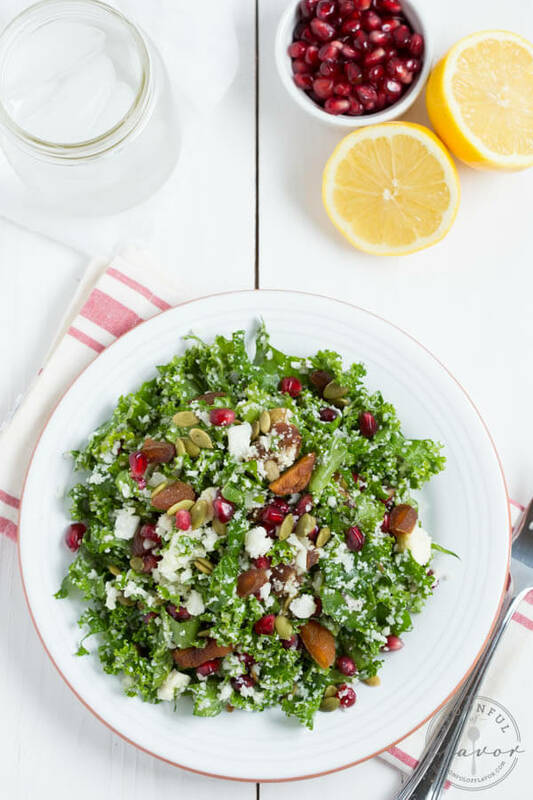 Go ahead, grab a big bowl of this salad and dig in! If you want a little more protein, you could also layer the salad with grilled chicken breast. Place the cauliflower into a food processor and pulse until the cauliflower pieces are about the size of rice. In a medium skillet over medium heat, add coconut oil and onions and cook until soft, about 5 minutes. Add cauliflower "rice" to the pan and cook 2 minutes, stirring frequently. Transfer the cauliflower to a large bowl. 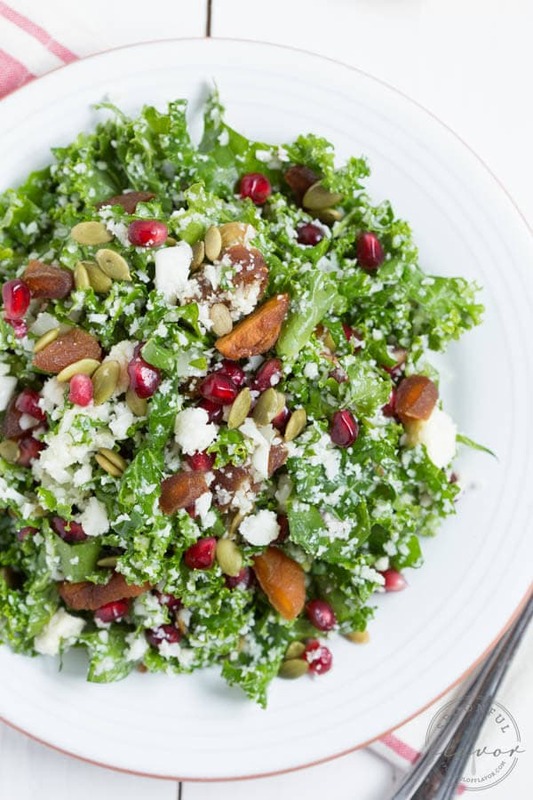 Add kale, lemon juice, olive oil, pomegranate arils, pumpkin seeds and dried apricots. Toss well to combine. Season with salt and pepper and serve. 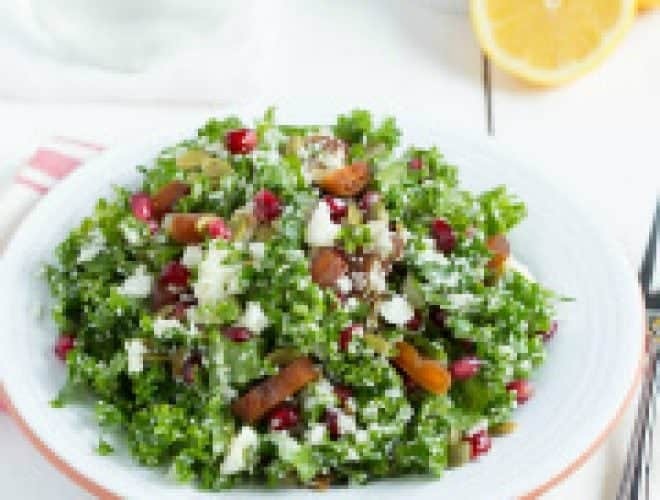 Love the combo of kale, dried apricots and pomegranate! Stopping by from BOTW! Congrats on the feature! I like that you included some examples of winter vegetables...very informative. 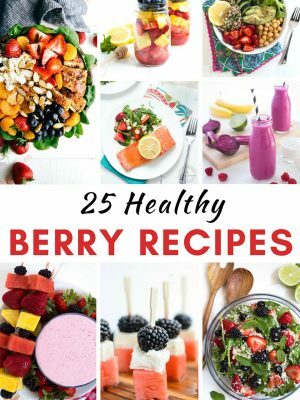 This would make a delicious salad for lunch! This looks delicious! 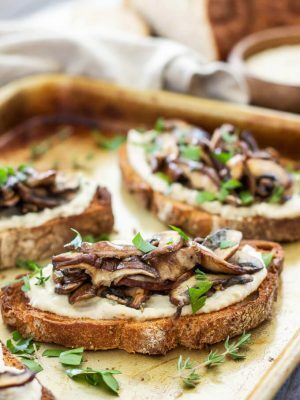 I'm planning on making this tonight but was wondering how exactly you make it ahead. Will it stay for a few days all assembled or should I keep the cauliflower separate? Thanks! Hi, Emily! You can prep it ahead of time however you want. I make the entire salad and store it in the fridge in a sealed container and it stays fresh and crunchy for me for at least 2-3 days. The cauliflower isn't cooked very long so it stays crunchy. Sometimes, I wait and add the apricots at the last minute. I hope you love it! Now that is one nice looking salad! Love all of the colours! This salad looks so fresh and vibrant! Love all the flavors you've combined! So unique! Pinned! 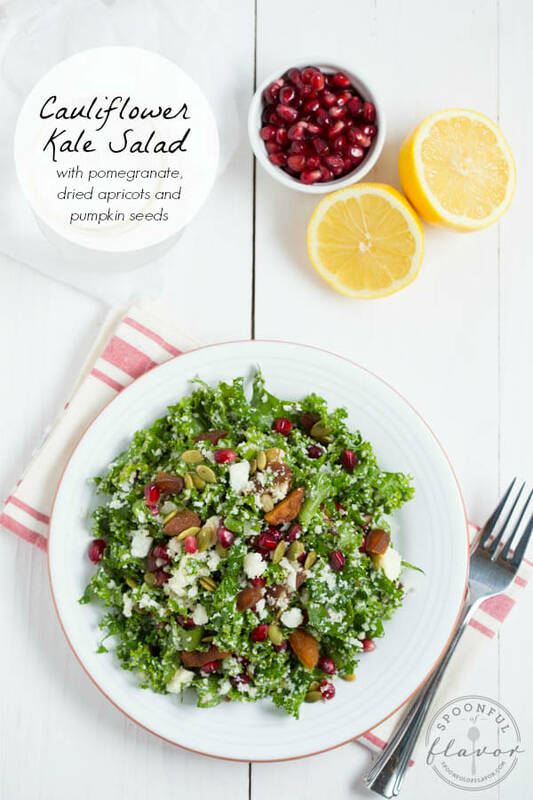 This salad is definitely one I will be making as I often make power kale salads like this for dinner. Can't say that I use cauliflower that often though but I definitely am inspired to now. I've been trying not to pack my calendar this year too - so far I'm doing really well!! Trying to prioritize down time and sleep! 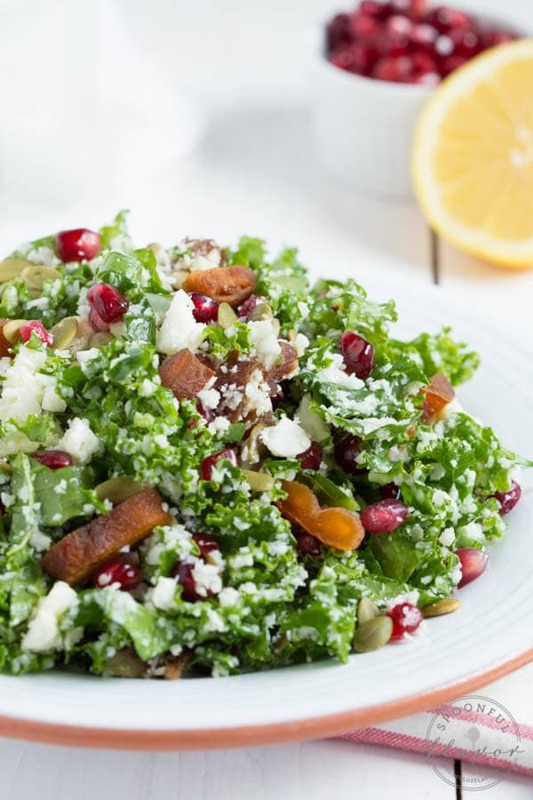 And this salad looks absolutely fantastic lady!